Many computational programs exist that are being used by industry for predicting properties of polymer composites, but their general predictive power is limited by how faithfully the microstructure is represented and how realistically the interfaces are handled. These computations are frequently limited by an over-simplified description of additive particle shape and dispersion. These models are also limited in their description of interparticle interactions, the intricate intertwining of particle property, shape, and changes in the polymer matrix that occur because of the addition of particles. This situation has limited the intelligent design of materials based on the judicious choice of particle size, shape and the intrinsic properties of the particles in comparison to the matrix to which they are added. Particle shape selection and an understanding of how particle properties affect the composite properties of advanced light weight material properties for energy storage, generation and transportation applications are then basic to the practical development of diverse advanced materials. There is thus a pressing need for a computational method that is flexible to all possible shapes of particles and that can accurately calculate composite properties based on realistic information about particle shape taken from measurement. It is also important to make these programs available to industry to aid in their efforts aimed at materials design. Particle characterization is also basic assessing the environmental impact of particles released into the environment. 1) Precise particle shape specification based on observation, 2) calculation of particle properties and 3) the calculation of the effect of particle shape on the properties of the polymer materials. P = Po [1 + [P] c + O(c2)], in the particle concentration. Specifically, P is the shear viscosity, thermal and electrical conductivity and the shear and bulk moduli of the composite. The relevant virials are the intrinsic viscosity, the intrinsic conductivity, the intrinsic shear modulus, particle diffusion coefficient, intrinsic bulk modulus, intrinsic Poisson ratio, intrinsic dielectric constant, intrinsic refractive index, intrinsic magnetic permeability, intrinsic hydrodynamic effective mass, and others. These virial coefficients are functions of particle shape, the interface between particle and matrix, and the property contrast between the particle properties which is defined by the property ratio, Pparticle / Pmatrix . Mathematically these property calculations are ‘classical’ in the sense that they involve the solution to well-known continuum mechanic equations (Laplace, Poisson, Navier-Stokes, Kelvin, Maxwell. etc. ), but the treatment of complex particle shape and boundary data is intractable analytically and provide a challenge for any existing computational resource. The basis of our method is a newly developed path-integral algorithm that solves these problems by averaging over random walk paths. Since the path-integral approach underlying ZENO is non-standard in materials modelling, we briefly describe its basis and the method of implementation. ZENO first involves enclosing the arbitrarily-shaped object within a sphere from whose surface random walks are launched. The probing trajectories either hit or return to the launch surface (‘loss’) as shown in the figure for a model soot particle aggregate, whereupon the trajectory is either terminated or re-initiated. 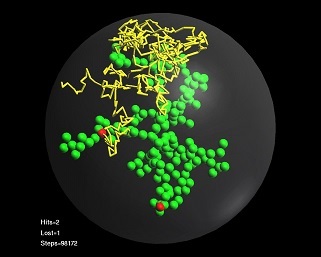 Figure 1: Collection of spheres (green) represents a model soot particles (cluster-cluster aggregate) and the path (yellow) represents a probing random walk trajectory. The hydrodynamic radius of the soot particle is determined by fraction trajectories that hit the sphere. ZENO permits great flexibility in defining particle geometry, e.g., beads, cylinders, ellipsoids, and surfaces with triangulated surfaces, so as to allow more physically realistic modeling of particle structure. ZENO is computationally faster than competing methods for complex geometries and is completely parallel. Most methods have computational times O(n3) where n is the number of body elements, but ZENO computational times are O(n). This is a serious factor for complex bodies where n is large and for random objects where ensembles of objects must be generated and sampled. 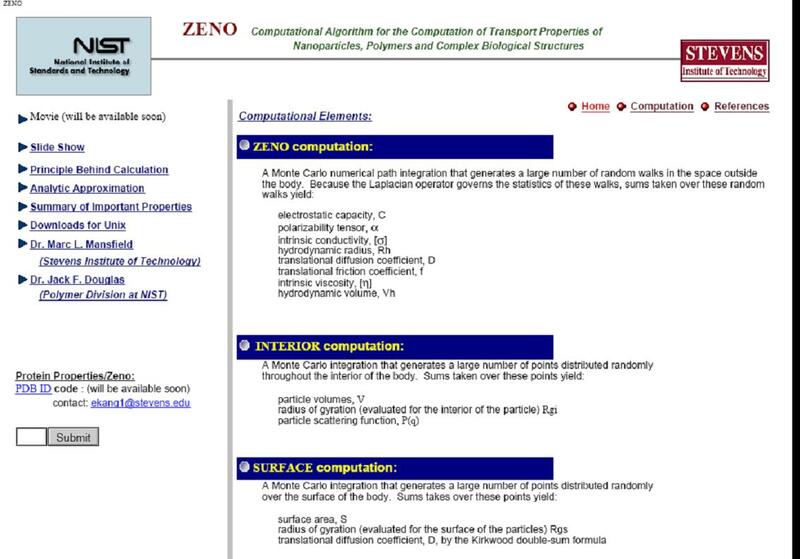 Figure 2: Webpage for ZENO which explains principle and method of computation, downloadable programs for public use and references providing computational validation. Currently, the ZENO programing is in the process of being transferred to the NIST, Gaithersburg domain and the program is being updated to include new properties and to allow more facile input of computational and experimental data relating to particle shape to enable greater practical use of the program. Recent work in the Polymers Division has emphasized the computation of the friction coefficient and intrinsic viscosity of carbon nanotubes, modeled both as rigid rods and conformationally flexible worm-like cylinders. In particular, the ZENO program has been successfully been validated against molecular dynamics simulations of the melt viscosity of polymer nanocomposites containing particles having diverse shapes [1,2] and the program has been applied to semi-flexible carbon nanotubes structures, graphene-like particles, DNA and diverse biological structures. A notable recent advance has been made to reduce the uncertainty of the ZENO program to the estimation of intrinsic viscosities of essentially arbitrarily-shaped particles to a value on the order of 1%. ZENO has also been recently applied to describe how the grafting of polymer interfacial layers to the surfaces on nanoparticles alters their transport properties, a neglected area of nanoparticle characterization. Workers at Sandia National Laboratories have been using ZENO has a material design tool in the development of novel thermal interface materials. 1) Heine et al. Journal of Chemical Physics vol. 132, 184509 (2010). 2) Knauert et al. Macromolecules vol. 43, 3438 (2010). 3) Mansfield and Douglas, Macromolecules vol. 40, 2575 (2007); ibid. vol. 41, 5412 (2008). 4) Mansfield and Douglas, Phys. Rev. E vol. 78, 046712 (2008). to scattering measurements: virial coefficients for thermal and electrical conductivity, dielectric constant and refractive index, magnetic permeability, and far-field scattering lengths in acoustic and light scattering. 1) J.F. Douglas, H.-X. Zhou, J.B. Hubbard,“Hydrodynamic Friction and Capacitance of Arbitrarily Shaped Objects,” Phys. Rev. E 49, 5319 (1994). 3) M.L Mansfield, J.F. Douglas,“Transport Properties of Wormlike Chains with Applications to Double Helical DNA and Carbon Nanotubes,” Macromolecules 41, 5412 (2008). 4) M.L Mansfield, J.F. Douglas, Saba Irfan and Eun-Hee Kang, "Comparison of Approximate Methods for Calculating the FrictionCoefficient and Intrinsic Viscosity of Nanoparticles and Macromolecules" Macromolecules, 40, 2575 (2007). 5) Scott T. Knauert, Jack F. Douglas and Francis W. Starr, "Morphology and Transport Properties of Two-Dimensional Sheet Polymers", Macromolecules43, 3438 (2010).